Plans to cut up to 2000 jobs at Wolverhampton City Council have been approved at a meeting to set the budget for the next twelve months. Protesters gathered outside the council building yesterday evening as a meeting to vote through the budget was taking place. Workers say the cuts are too deep but the council says it needs to make £123 million pounds of savings over the next five years. Staff at Wolverhampton City Council have been told that up to 2000 of them might lose their jobs because of budget cuts. Plans to make more than £120million of budget cuts will be revealed today at Wolverhampton City Council. Around 1,000 jobs are at risk as the Council struggles to make the savings needed. Leaders have previously said frontline services could also be affected. Unison has said that Wolverhampton City Council has called 6000 staff members to attend a meeting at the Civic Hall tomorrow for 'mass consultation'. Nottingham City Council will be forced to cut more than 75 jobs under its budget proposals for next year. 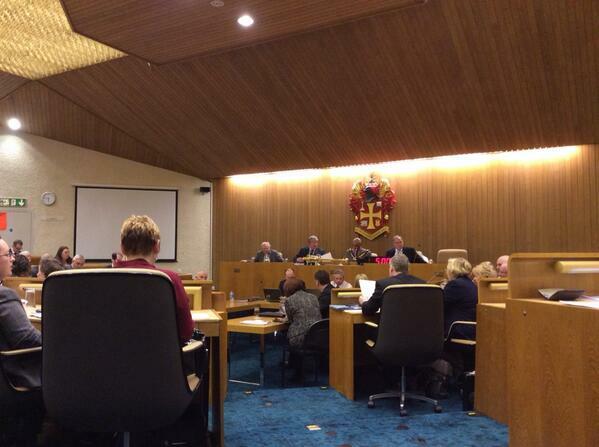 The council needs to make more than £25milliion in savings in the next financial year. Many of the jobs will be lost through current vacancies that will not be filled but the council says it cannot rule out forced redundancies. Plans to revamp one of Derby's shopping and business districts have gone on display to the public today. The city council is planning to spend £1million to redevelop St Peter's Cross, which it says will make this part of the city more vibrant and draw in businesses and visitors. Residents in Derby say a new £40 charge on the collection of brown bins for garden waste in Derby will lead to fly-tipping and unnecessary extra costs. From April next year the council will charge to collect garden rubbish as they look to make savings of around one million pounds. The council are encouraging people to compost their garden waste at home and have said that all garden rubbish can be put in the regular black bin instead. From April next year people in Derby will have to pay £40 for their garden rubbish to be collected as the city council put a stop to free collections of brown bins in a bid to save around a million pound. This week will mark the final week of free collections from the council before it stops with plans to restart next April at a cost of £40 per collection. There will also be a £20 charge for any additional bins. Derby City Council say the collection of garden waste is not a service they ‘must provide’ and is what is known as ‘a discretionary service’. They say the decision has been made because of government cuts which mean they need to make savings to balance their budget. Garden waste can still be put in the regular black bins provided but if people would like the council to continuing collecting their bins they must sign up to the service by the end of 2013. Warwickshire County Council has announced that in the next four years there will be job cuts, with a maximum of 627 positions being removed. The Council also says compulsory redundancies are inevitable but it hopes this will be through natural wastage. In the last three years, the Council has lost 1500-1600 staff. At present, the Council employs around 7500 people excluding schools. Conservative councillors in Corby have condemned some Labour colleages as 'sick and disrespectful' after they disrupted tributes to Baroness Thatcher in a meeting. The Tories got so angry they walked out after some Labour colleagues interrupted a tribute speech last night by wandering in and out of the chamber. Here's Matthew Hudson's report.